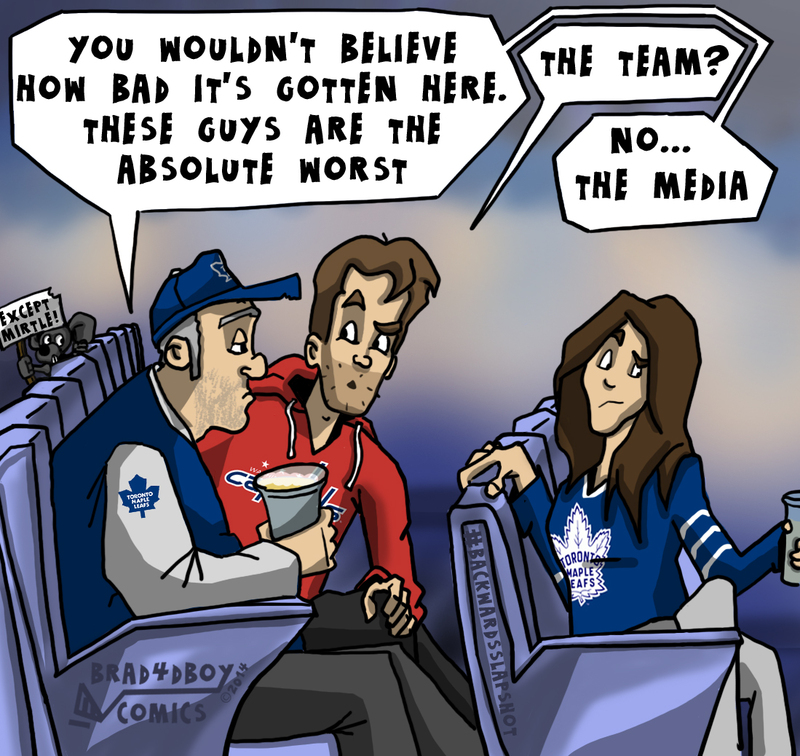 Sorry for the new comic hiatus... hopefully the All Star Game comic embedded in Becca H's article will satisfy your Backwards Slapshot needs for a bit. There should also be a "Behind the Scenes" post that I wrote a while back going up at Japers' Rink in the next week. Anyway, thanks for the patience as I am finishing up my dissertation proposal and will be MIA until sometime next week. Thanks for following along! So with the break coming up for the All Star Game, look out for a comic about Backy's snub this week, and also a process piece bringing you behind the scenes of Backwards Slapshot to see how the comics come together. Radio is alive and well Caps nation. I recently contributed a comic to the post titled Prew or False, an effort by Japers' Rink to tribute and poke fun at Washington Post Capitals beat writer Alex Prewitt. He took it well and played along, retweeting the article and bantering with us about the post. And while it's always a goal of mine to draw the attention (and hopefully praise) of the subjects of my comics - since they're all done in jest - in this case, the comic also drew praise from another member of the media, radio voice of the Washington Captials John Walton. In return, I tip my hat back at John. He has always been one of my favorites. In fact, his voice often fills my ears as I draw the Backwards Slapshot series. I'm not sure what it is, but there's still something special about listening to hockey on the radio. As a kid, I remember listening to a garbled radio broadcast of my older brother's junior hockey games using an old dial-up connection. Thankfully, due to technology, these days you can simply log on to the Caps website and enjoy a crisp version of John and crew from anywhere in the world. Hockey voices like John are somehow able to tap into the morale of the fans, match the fans' passion and energy, and simultaneously keep their composure enough to articulately deliver the high-speed action. This is a skill that takes ambitious professionals years to hone, but for whatever reason, hockey voices do it best. They praise their teams during winning streaks and deliver bad news during losing streaks in a manner that would make even oncologists proud. Either way, they both audibly personify and help shape the identity of a team for fans. For me, John's voice will always be synonymous with the Caps. His enthusiasm and description of the game is second to none, and I look forward to his continued work. Maybe one day he'll provide me some material to caricature his personality into a comic. For now though, he's safe. So if you haven't listened to a radio hockey broadcast in a while, tune in to the Capitals Radio Network for a game and listen to one of the best. You won't be disappointed. Backwards Slapshot heads to Toronto today! Robby makes a trip to see his team in the home that Air Canada built, or bought the naming rights to, or whatever. He is greeted by unsettled Toronto fans... some excited about Randy Carlyle's departure, some confused why Phil Kessel is still a part of the team, some too upset about the team in general to even talk about it. Either way, Robby settles in to watch the game and get the scoop from the hometown fans. Enjoy! And while I was hoping that the captain would end it, potentially sending my anticipated comic into overdrive, I was pleasantly surprised by the incredible ending via Troy Brouwer. What a game! What a finish!. Hopefully y'all enjoyed the experience, I know I did. It was definitely enhanced by Japers' Rink's incredible coverage of the event before/during/& after... They are truly amazing people who work tirelessly to provide a unique vantage point on our favorite NHL franchise. Here's to more in 2015! !